Date of Birth: December 5, 2000 a.t.b. 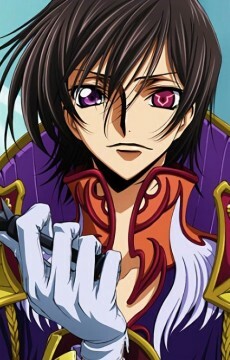 Lelouch is introduced in the first episode of the series as a student of Ashford Academy high school, where he is a member of its student council. A brilliant thinker who is quite talented at chess, he lives with his younger sister, Nunnally, with their maid, Sayoko Shinozaki, at a house situated within the compounds of Ashford Academy, where they are looked after by the Ashford family. Lelouch is soon swept into the conflict between the Britannia Empire and the pockets of resistance which oppose it when he accidentally boards a truck being used by Japanese resistance operatives. Within the truck is a capsule holding C.C., who sacrifices herself to save him from the military forces trying to recapture her. When it seems as if her sacrifice was pointless, C.C. suddenly touches his hand and offers him the "Power of the King", the mythical power of Geass. The Geass manifests itself in him as the power of absolute obedience, which allows him to make people obey his orders without question. With his new power, Lelouch begins his rebellion against the Empire, forming the Order of the Black Knights and takes up the identity of Zero to lead them, becoming a revolutionary and gaining popular support amongst the people. Lelouch is the son of the Emperor of Britannia, Charles zi Britannia, and the late Imperial Consort Marianne, making Lelouch the eleventh prince of the Britannian Imperial Family. He was seventeenth in line for the throne prior to his mother's assassination and his sister's crippling in the same incident. A ten year old Lelouch confronted the Emperor afterward and accused him of leaving his mother defenseless, even going as far as renouncing his entitlement to the throne. In response, his father banished him to Japan, where he was used as a political hostage in the Sakuradite conflict. It was during his stay at the Kururugi household that he first met Suzaku Kururugi, with whom the young Lelouch did not interact initially in a friendly manner, before later becoming friends. However, when Britannia finally developed its Knightmare Frames fleet and decided to invade Japan to seize control of the Sakuradite mines, consequently discarding Lelouch's use as a diplomatic tool, Lelouch, fearing for his and his sister's safety, hid their true identities and sought the help of the Ashford family, who were his mother's allies. His mother's death and his father's apparent lack of concern in regards to it were huge blows to Lelouch. He always felt that it was unfair for both his mother and sister, and therefore made it his goal to pursue a better world for Nunnally. He also seeks to discover the true reason for his mother's death, as she was murdered in the Aries Imperial Palace, a place terrorists would be unlikely to penetrate successfully without being noticed, if at all. Shortly after gaining the power of Geass from C.C., Lelouch assumes the secret identity Zero, a mysterious, masked revolutionary dressed in a black helmet and cloak. The helmet has a retractable plate over the left eye so Lelouch can use his Geass. In this guise, he forms the Order of the Black Knights, initially composed of the members of Kallen Kōzuki's resistance group. The goal of this vigilante group is a campaign against powerful individuals who oppress the helpless, which he eventually expands into reforming Japan as an independent nation. Lelouch is willing to do whatever it takes to accomplish his goal, even if it means lying to his followers and using people as bait for the outcome he desires. However, he has trouble putting those he is close to in harms way for the sake of his goal, which is a weakness as a commander but a remnant of his humanity and sanity. His feelings for Nunnally in particular often hinders his plans, particularly at the end of the first season, where he abandons a massive war with Britannian forces to rescue her. Gradually, however, he has come to embrace the fact that he has to destroy before reconstruction can occur, even if it means harming those he cares about. Originally, Lelouch is motivated by the desire to avenge his mother's death and construct an ideal world where his sister Nunnally can live in peace. After Nunnally becomes Viceroy of Area 11, and her wishes conflict with his goals, his friends help him to realize that his rebellion is no longer just for Nunnally, but for all the people of the world. Following Nunnally's death and the betrayal of the Black Knights, Lelouch focuses on making sure that he at least takes the Emperor down with him. The turning point in his rebellion comes when Euphemia li Britannia declares the region under Mount Fuji the Special Administrative Zone of Japan, giving the Japanese people their name and country back, albeit in a much smaller area. This effectively destroys any possibility of the Black Knights' rebellion; acceptance would render them powerless and refusal would make them pariahs. Lelouch confronts her at the opening ceremony and tries to have her shoot him, hoping to make himself a martyr. When she says she plans to give up her title, he surrenders and agrees to work with her. However, at this moment his Geass permanently activates, and an offhand comment about ordering her to kill the Japanese forces her to do just that. Lelouch reluctantly kills her and uses the massacre as an excuse to declare Japan an independent nation. He then leads an attack on the Tokyo Settlement. The attack goes well at first, but when Lelouch learns that Nunnally has been kidnapped, he abandons the battle, leaving his forces helpless against the much better organized Britannian forces. Lelouch and C.C. make their way to Kaminejima to search for Nunnally, where Lelouch is confronted by Suzaku Kururugi. Lelouch attempts to broker a truce, but Suzaku is distraught over the death of Euphemia and refuses to listen. An angered Lelouch draws his pistol and both Lelouch and Suzaku attempt to shoot one another. A single gunshot is heard as the screen fades to black at the end of the first season. One year later, Lelouch is living a peaceful life with his younger brother, Rolo Lamperouge, and has no memory of his revolutionary activities, his Geass, Nunnally, his mother, or his royal lineage. Flashbacks reveal that neither Suzaku or Lelouch managed to kill one another. Instead, Lelouch was apprehended and brought before the Emperor, who used his own Geass to wipe Lelouch's memories and suppress his power. Lelouch's memories and Geass are restored by C.C., and he resumes leadership of the Black Knights. To prevent retaliation by the Britannian forces, he makes his base in the Chinese Federation's consulate. When Nunnally is appointed as Viceroy of Area 11, and announces her plans to reestablish the Special Administrative Zone of Japan, Lelouch falls into depression since he would be impeding her wishes by continuing his rebellion. He nearly begins taking Refrain before Kallen stops him. With the help of Kallen and his friends at the Ashford Academy, Lelouch realizes that his mission no longer revolves solely around Nunnally, but concerns the rest of his friends, and the Japanese people as well. To solve both concerns, Lelouch engineers the legal exile of the Black Knights by getting the Britannians to agree to exile Zero in exchange for bringing one million participants for Nunnally's new Japan. By having them all dress as Zero, he forces Suzaku to exile them all rather than order a massacre. Sayoko stays behind as his body double to keep up the illusion that Lelouch and Zero are separate people, though during her short tenure as his impersonator she changes his image into that of an athletic womanizer. The Black Knights escape to the Chinese Federation, where Lelouch begins his plans to win more countries to his side, creating a alliance that can match the Britannian Empire. He starts by overthrowing the High Eunuchs of the Chinese Federation and returning control to Empress Tianzi. He also has a secondary motive in doing so: the Chinese Federation is where V.V. 's Geass Directorate is headquartered. By taking control of the directorate, Lelouch believes he will be able to match the Emperor in both military and Geass might. While the remaining dissident forces are cleaned up, Lelouch returns to Japan to prepare for the invasion by installing Gefjun Disturbers in the mass transit rail system. The combined effect of every train running a Disturber would shut down Tokyo Settlement completely. After Shirley is killed by Rolo, Lelouch abandons his plan to take over the Geass Directorate, instead mounting an all-out assault on their stronghold. He orders the deaths of everyone within, resulting in the death of General Bartley among countless others. V.V. tries to use the Siegfried to buy time for the remaining members to escape, but it is destroyed with the aid of Cornelia while C.C. annihilates the remaining followers. Lelouch chases V.V. back into the temple, where he is unexpectedly teleported to the Sword of Akasha to face the Emperor. Lelouch attempts to kill the Emperor, but he has become immortal like C.C. The Emperor tells Lelouch about the world's lies, and shortly after C.C. arrives, finally revealing the contents of their pact. She would have had Lelouch kill her and take on her immortality, but instead spares him by placing him inside her memories while the Emperor kills her. Lelouch refuses to let her die unhappy and convinces her to live on. Lelouch destroys part of the Sword of Akasha and is transported back to the real world with C.C., but her memories of her life after gaining Geass have been erased. Lelouch then completes ratifying the United Federation of Nations, and their first act is to liberate Japan. To insure Nunnally's safety, Lelouch agrees to meet Suzaku alone at the Kururugi Shrine. Suzaku demands answers about Lelouch's various uses of Geass, but Lelouch lies, claiming that everything he has ever done was purely for selfish reasons. Suzaku realizes that Lelouch is lying and agrees to help, but Prince Schneizel's troops move in to arrest Lelouch, convincing him that Suzaku sold him out. Lelouch escapes with the help of Guilford, having used his Geass to make Guilford see him as Princess Cornelia, and uses the Gefjun Disturber trains to shut down Tokyo Settlement. He resolves to abandon his emotions in order to achieve his goals, having lost his faith in friendship. In the second battle of Tokyo, Lelouch directs his forces to focus on the government building in an effort to secure Nunnally. Suzaku threatens to use the F.L.E.I.J.A. bomb unless Lelouch stands down, but Lelouch merely waves him off as a liar. Once Kallen escapes in her upgraded Guren and Suzaku becomes an obstacle, Lelouch orders her to kill him. As her Knightmare is far more advanced, she nearly succeeds. Suzaku's imminent defeat activates his Geass command, causing him to launch F.L.E.I.J.A. The bomb engulfs the government complex, killing Nunnally among countless others. Lelouch goes into a nervous breakdown at the thought, refusing to believe that Nunnally could be dead. His identity is then exposed by Schneizel and the Black Knights betray him. Rolo evacuates him, but dies in the attempt. In the end, Lelouch comes to terms with his feelings for Rolo. Having lost everything as retribution for his acts, he realizes that the last thing he must do is drag his father into hell with him. With his renewed purpose, Lelouch quickly sets off to defeat the Emperor, throwing the Britannian ranks into chaos by using his Geass to make numerous soldiers slaves to his will. As the Britannian forces battle one another, Lelouch confronts the Emperor in the Sword of Akasha, sealing the entrance behind him so they will both be trapped for eternity. Geass: Lelouch's Geass, given to him by C.C., grants him "the power of absolute obedience," allowing him to plant commands within a person's mind upon eye contact which they will obey without question. Activation of his Geass is visually represented by the manifestation of a Geass sigil in his left eye. Commands dictated in this state are written into the minds of the designated targets once the sigil projects from his eye to theirs. Lelouch could initially toggle Geass activation at will, but subsequently loses this control to an affliction known as Geass runaway. In the second season, C.C. gives Lelouch a contact lens that blocks his Geass, but indicates that his Geass will eventually grow powerful enough to render it ineffective. Of all the Geass abilities in the series, Lelouch's has been explored the most, and also seems to have the most restrictions and side effects of any Geass introduced. Commands must be issued verbally. The victim must make direct eye contact for commands to be issued. The maximum effective distance is 270 meters. Line of sight via a reflective surface is sufficient for the effect to occur. Commands may be issued only once to any given individual, but any number of commands may be issued at initial application so long as eye contact is unbroken. Since Jeremiah's Geass Canceller negates all Geass effects, those exposed to it may be commanded once again. The victim will not perform any action disallowed by their physical or mental capabilities, though they will try to carry out the command to the best of their ability. For example, a victim will not be able to correctly answer a question they don't know the answer to, but will direct the user to someone who can if they are able. However, commands that affect the mind or consciousness, such as telling the victim to forget something, will take effect despite the fact that the victim could not normally force themselves to do so. An action will be carried out for as long as dictated in its command, or upon the indicated conditional circumstance. Eye contact does not need to be maintained for command execution to occur. No upper limit has been established, but the conditional command Lelouch gives Suzaku is still in effect more than a year later. The victim's memories for the duration of command issue and execution are sealed and cannot be recalled. * A victim may resist a commanded action to some degree if it is utterly repugnant to them. So long as the above conditions are met, commands may be issued to anybody besides those who have gained the power of immortality and to any number of individuals at once. Those under the effect of Geass have a red outline on their pupils, presumably a visual cue for the viewer since the characters never point it out. Even without his Geass, Lelouch is a formidable opponent. He is highly intelligent, possessing a genius-level intellect, and is capable of devising and executing strategies with incredible speed and precision. Rolo notes that operating the Absolute Defense Territory of the Shinkirō requires complex calculations which he cannot perform, while Lelouch almost makes it look easy. In the audio dramas, Suzaku says that, when they were children, Lelouch devised a secret sign language containing over 500 words. Lelouch is quick to deduce facts from simple clues. In episode 14, when Mao says C.C. 's name, Lelouch instantly comes up with fourteen different possibilities for Mao's identity, including the correct one. Lelouch is also able to predict the Lancelot's actions exactly through his study of their past battles, allowing Kallen and the Four Holy Swords to almost defeat it (only Suzaku's reflexes saved his life). Lelouch is also charismatic and persuasive; as Zero, he is able to win the support of much of Japan's population through well-delivered speeches combined with his ability to make miracles in almost any situation through his superior tactical planning. Mao repeatedly praises Lelouch's persuasive talent, and V.V. remarks that Lelouch is "a lot like his father." Physically, Lelouch is underwhelming. He possesses the physical prowess of a teenager who engages in little to no strenuous physical activity. Thus, one of Lelouch's traits is the inability to run very fast or for any substantial period of time. Within the series, this is usually played for comedic effect, as Lelouch is constantly outpaced by his classmates in every situation, and even the most simple tasks requiring manual labor exhaust him before he manages to accomplish anything significant. This joke is taken to its logical conclusion in the second season, where it is revealed that Lelouch is supposed to attend remedial physical education classes, but skips them as often as possible. This creates problems when Sayoko poses as Lelouch: she is a master of martial arts, and hence far more athletic than Lelouch himself. Lelouch laments the problem and decides to have Sayoko attend his gym classes to fix it. Lelouch is also shown to be very talented at most domestic skills, including cooking and sewing; it has been stated that this comes as a result of his taking care of himself and Nunnally for seven years. He has been shown to be an excellent cook, and is usually the one cooking the food for parties held by the Student Council, both because the others (except Milly) are terrible cooks and nobody else can meet his exacting requirements (such as measuring ingredients to three significant decimals). Lelouch also has some skill with firearms, usually brandishing a Britannian pistol when threatening someone. His Knightmare piloting skill has been shown to be proficient but not exceptional; he is a capable pilot by himself, though he tends to be overwhelmed by Suzaku and other pilots with more advanced Knightmares at their disposal. When Lelouch pilots a standard Knightmare on the battlefield, he is typically accompanied by Kallen, who is an elite Knightmare pilot and the leader of his personal squad, Squad Zero. After stealing the Gawain, Lelouch co-pilots it with C.C., controlling the weapons and command functions while C.C. handles navigation and flight. After the Black Knights are exiled from Japan, Lelouch pilots the Shinkirō, which has the most powerful defense of any Knightmare. At the end of season 2, Lelouch ordered Suzaku to kill him so that his sins and all the people's hatred will disappear and he will be free. Killing him will be a key to future happiness. After Lelouch died, Nunnally realized that without her brother she cannot live even though she was away from him for a very long time.